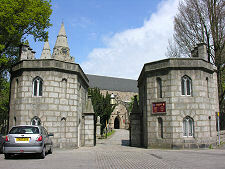 St Machar's Cathedral can be found in Old Aberdeen not far from the south bank of the River Don. 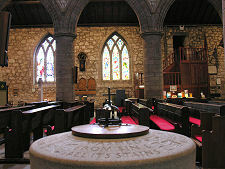 As part of the Church of Scotland, a presbyterian church without either bishops or cathedrals, St Machar's is technically not a cathedral, but is often referred to as such. 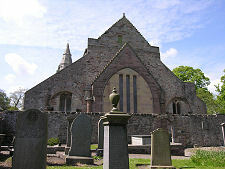 It is more properly known as The Cathedral Church of St Machar. This is a distinction that can seem almost trivial to modern eyes. Yet it is one that has caused serious conflict more than once in the past, and which directly led to the wars that engulfed Scotland, England and Ireland in the middle of the 1600s. But the starting point of the story of St Machar's is much, much earlier. 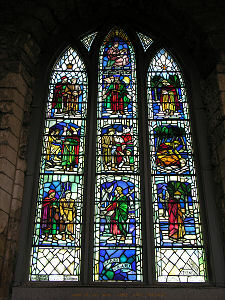 St Machar was a Celtic saint, a follower of St Columba, who established a place of worship in Old Aberdeen in about 580. It seems a distinct possibility that the site he chose was the one now occupied by the church named after him, and amongst the objects on display is a stone carved with a Celtic cross believed to have been associated with this original church. Possibly more convincing evidence for the link comes from the decision in 1131 by David I to move the seat of a bishopric from Mortlach near Dufftown to this site, rather than to his new Royal Burgh of Aberdeen, some distance to the south, explicitly because of its links with St Machar's	church. By 1165 a cathedral in the Norman style had been largely completed here. 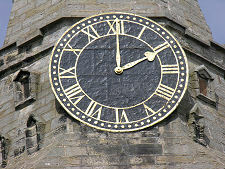 The first cathedral lasted until around 1290 when work began under Bishop Henry de Cheyne to replace the Norman cathedral with one in the Early English style. In 1305 St Machar's is said to have been the final resting place for a quarter of William Wallace, after part of his body was brought to Aberdeen after his grisly execution in London by Edward I, and interred within the wall of the new cathedral. 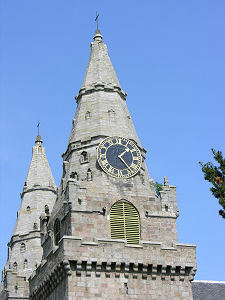 The cathedral, probably in a fairly advanced stage of completion, seems to have been badly damaged when Aberdeen was sacked by Edward III in 1336. After this setback, work continued, though on a grander scale with plans that now included two western towers. 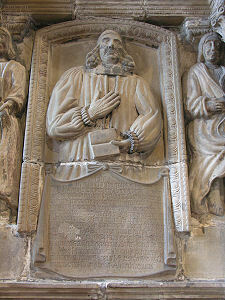 The poet John Barbour was appointed Archdeacon in 1356. 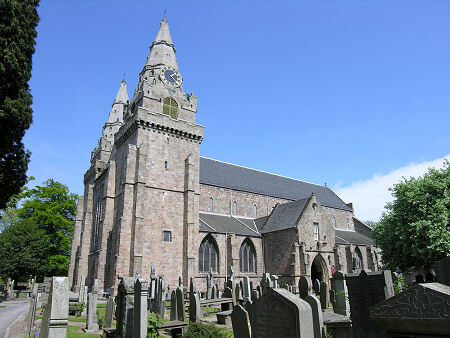 It probably took until around 1450, for St Machar's Cathedral to be functionally complete. At this time the nave and western towers you can see today formed only part of the building. To the east of the nave was a crossing surmounted by a large central tower. Transepts projected north and south from the crossing, as did a choir to its east. 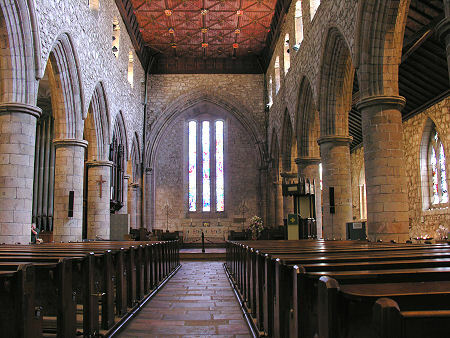 Staffed by 29 canons, each with his own manse within the Cathedral Precinct, St Machar's Cathedral played an important role in the spiritual and political life of North East Scotland. Bishop William Elphinstone founded Kings College, Aberdeen, in 1495 and established Old Aberdeen as a burgh in its own right. He also added a spire to the top of the central tower. His successor, Bishop Gavin Dunbar, rebuilt the choir and the south transept and in the 1520s added spires to the tops of each of the two western towers. After 250 years of almost continuous building, by about 1530 St Machar's was finally complete, and at the height of its power and glory. This was to last just 30 years. The Reformation of 1560 changed everything. At one level, the rampaging mobs attacked all signs of the "Popery" they so hated, and many of the cathedral's valuable objects and books were stolen or destroyed. At a more functional level the building became the parish church of Oldmachar, with two ministers taking the place of the 29 canons and other clerics who had officiated here in pre-Reformation times. Interference by Charles I meant that the 1630s were marked by shifts between episcopalian and presbyterian forms of government of the church in Scotland: in other words government with and without bishops respectively. The result was huge dissatisfaction across Scotland, which on the whole favoured a presbyterian approach, and in 1638 the National Covenant was signed by many thousands of Scots in an effort to persuade the King to allow his Scots subject to preserve their distinctive cultural and religious practices. Charles I took this as rebellion against his authority, and his efforts to quell the Scots led to conflict with his English Parliament and to what are best described as the Wars of the Three Kingdoms, the decades of conflict that engulfed Scotland, England and Ireland and which include the rather mis-named English Civil War. As we all know, this did not turn out well for Charles I. Neither did it turn out well for those in Scotland who supported the idea of a church governed by bishops. As it happened, clerics in Aberdeen were especially vociferous in their opposition to the National Covenant, and as a result much of value in St Machar's that had survived the Reformation failed to survive the religious conflicts of the 1600s. 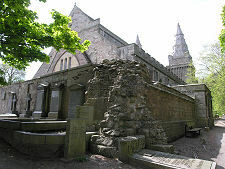 In 1654 Cromwell's troops under General Monck occupied Aberdeen and removed the stone from the derelict bishop's palace to the east of St Machar's and from the now long-disused choir of the church for use in the construction of a fort. It is suspected that in removing the choir they may also have weakened the base of the central tower, because a storm in 1688 brought it crashing down, destroying the transepts and crossing, and damaging the nave. The east end of the nave was closed off by 1704, though work to tidy up the effects of the collapse of the tower on what was left continued until as recently as 1953, when a new east end was inserted into the nave, complete with three stained glass windows. 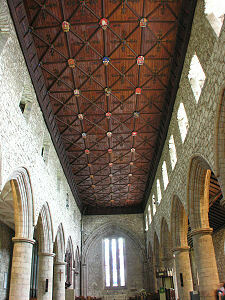 Physically, today's St Machar's Cathedral is what survived the 1688 collapse, give or take some tidying up. The church comprises the nave, flanked either side by aisles, plus the twin western towers complete with their crowning spires. On two sides the church is tightly confined by a very crowded churchyard, while on the north side a wall only a few yards from the church marks the boundary with Skene Park, which descends to the banks of the River Don. To the east of the church, the ground plan and some of the walls of the crossing and transepts can still be made out. 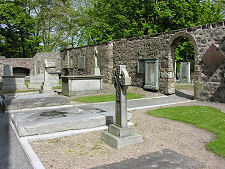 These are in the care of Historic Environment Scotland and include an alcove in which Bishop Gavin Dunbar was laid to rest in 1532. Beyond the transepts, no sign remains of the choir removed in 1654. 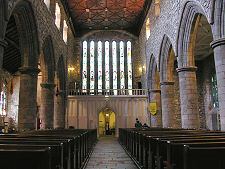 Inside St Machar's Cathedral, you are immediately struck by the simplicity of its overall shape and layout. You are also immediately struck by the stained glass that adorns virtually every window in the cathedral. These windows range in date from the 1870s to the 1970s and represents a truly magnificent collection. Elsewhere, it tends to be the smaller details that attract and hold your attention. Especially notable is the Sanctuary Cross in the south aisle. At first sight this seems to be a modern sculpture. 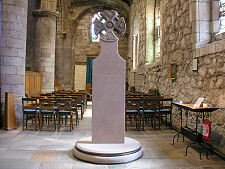 In fact the head comes from a 12th Century cross that stood to the east of the cathedral until destroyed in the Reformation, married to a shaft made by Alastair Urquhart in 2000. 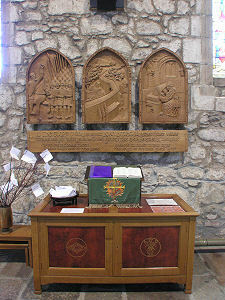 Nearby is the wooden Barbour Tryptich, dedicated to the early poet John Barbour who served as Archdeacon and made in 1997 by Roland Fraser. 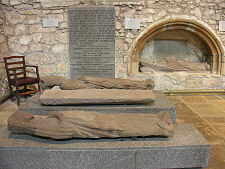 Perhaps the most striking residents of the north aisle are the effigies of three clerics, all dating back to the 1400s. 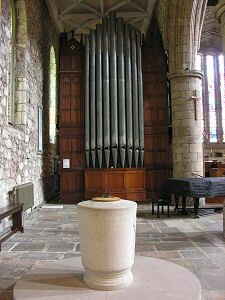 Two were originally outside the cathedral until given shelter within it in the early 1900s. One of these represents Bishop Henry Lichtoun, who died in 1440. 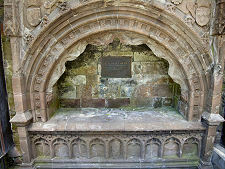 The effigy in the recessed arch is that of Walter Idyll, who died in 1468. Not far away is the granite font dating back to 1954.